LivingSocial confirmed on Friday, April 26th that they experienced a cyber-attack on their computer systems that resulted in unauthorized access to some customer data on their servers, including names, email addresses, date of birth for some users, and encrypted passwords (hashed and salted). The daily deals site joins a growing list of services who have been hacked in the last year and a half, including Zappos, Evernote, LinkedIn, eHarmony, and Last.fm. Although the passwords were hashed and salted, and there are no known dumps of the stolen data, it's plausible that a percentage of the password hashes are known or have been brute-forced to reveal the plain text passwords, given the increasing speed at which brute-forcing can be performed and the proliferation of weak and duplicate passwords. 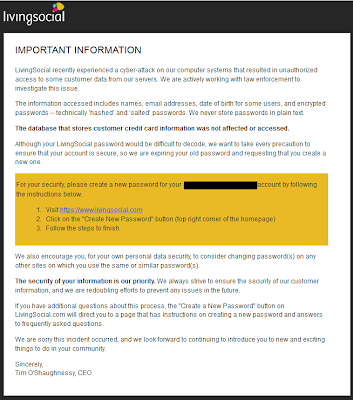 Echoing LivingSocial's recommendations in their email to the 50 million affected customers, we strongly recommend that anyone with a LivingSocial account follow the steps to update their password immediately, and update the password on any other accounts that used the same or similar password. Launch LivingSocial, click the "Create New Password" button on the top right corner of the homepage, and update the password to a new, randomly generated one using the LastPass password generator, located in the Tools menu in the LastPass Icon. The LastPass Security Check, in the Tools menu in the LastPass addon, will also help you identify any weak or duplicate passwords. Help us spread the word about secure password management to family, friends, and coworkers who would benefit from the ability to achieve higher security standards while making their online life easier. With generated passwords, hacks like these are less likely to pose a risk to their personal data, and recovering is a matter of a few clicks to generate a new password.